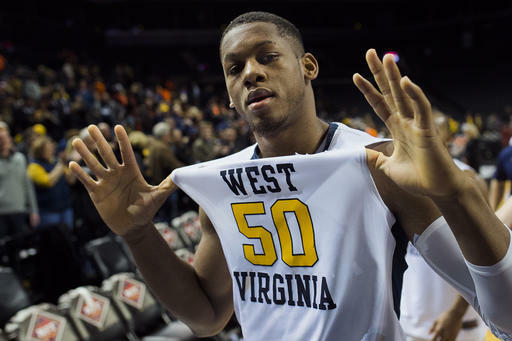 GAME OF THE WEEKEND: West Virginia at Kansas. The Jayhawks enter the weekend a game behind league-leading Texas Tech with five games left to play. The Mountaineers are two games behind the Red Raiders and can draw even with Kansas with a win in Allen Fieldhouse. West Virginia answered for a home loss to Oklahoma State with an 82-66 win over TCU to start the week, while the Jayhawks beat Iowa State 83-77 on Tuesday. LOOKING AHEAD TO SATURDAY: Oklahoma, which has lost four straight and seven of its last nine games, will try to bounce back against Texas in Norman. Texas Tech puts its seven-game winning streak on the line when it travels to streaking Baylor — which beat Kansas in Waco a week ago — and Iowa State will face Kansas State on the road. TCU and Oklahoma State square off in a matchup that could prove crucial to each team’s hopes for an NCAA Tournament bid. PLAYER TO WATCH: Trae Young, Oklahoma. Young is so dynamic he could be the guy picked for this category every week — but the freshman appears to have hit a wall. Young went 0 of 9 on 3s in Tuesday’s 88-78 loss at Tech, and he needed 21 shots to score 22 points in a loss to the Cyclones over the weekend. When Young is going right, the Sooners are a legitimate Final Four contender. When he’s not, they can look like the worst team in the league. INSIDE THE NUMBERS: Tuesday’s win gave Kansas 20 on the year. The Jayhawks have won at least 20 games for 29 consecutive seasons, the longest active streak in the nation. … TCU’s Desmond Bane is a league-best 50.5 percent on 3s. Teammate Kouat Noi is second at 46 percent. … There were just nine shooters above 80 percent from the line, led by Iowa State’s Donovan Jackson at 91.5 percent. ON THE WOMEN’S SIDE: Baylor and Texas have been in holding patterns in the Top 25. The Lady Bears have been third and the Longhorns have been sixth for weeks. … The conference could have four teams end up with losing overall records. Texas Tech, Kansas and Iowa State will enter the weekend below .500, while Kansas State is just 13-12 ahead of Saturday’s game at TCU.